SUMMARY : It’s the 1970′s in Jalalabad, an erstwhile princely state in Pakistan. Chandni is a self-proclaimed cynic and prefers to be called C. An orphan brought up by her domineering grandmother, a.k.a. The Broad, C is rebellious, quick-witted and stunningly beautiful. .
A charming breezy romance set in Pakistan in the 1970s. Add to that a the concept of “prince”, luxurious lifestyle – Isn’t that a perfect setting for a perfect little romance. The story is just that – A picture perfect romance. Our protagonist, Chandini, is a live wire with a soft core who was abandoned by her father and raised by her grandmother. Enters our hero, Taimur who annoys Chandini but is too hot headed to admit she is in love with her. Re- enter C’s long lost charming dad who can manage to charm even a stone who picks out a groom for C. C sadly, seems to be in love with a man who is quite older than her. Thus happens the “triangle” of men with C in centre. Eventually, C picks one of the three men. The literary charade between Tiamur and Chandini is an absolute treat for pure literary fans. The writing is filled with humor and spunky comebacks which makes the story a pleasurable read in spite of few critical elements missing - I felt there was a vast potential with that "daddy-daughter" episode which the writer sort of missed cashing into. Nevertheless, it's all about perspectives. The characterization is perfect for a short read, though I would have loved to read a bit more of C’s long-lost dad. VERDICT: Short and sweet refreshing read. Provided the perfect break I needed between hectic project deliveries (The day job circus show that I orchestrate). Zeenat Mahal (@zeemahal) is an avid reader and has been writing for as long as she can remember. She has an MPhil in English literature from Government College Lahore and an MFA in creative writing from Kingston University, London. She won a BBC short story competition in 2001 and has been a regular contributor to newspapers. 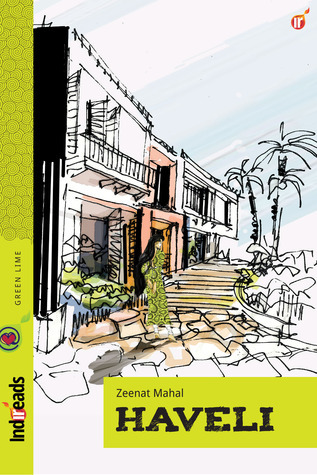 ‘Haveli’ and 'The Contract' are Zeenat’s first two published novellas. Her next novel. She Loves Me, He Loves Me Not, is due for release on 14th February, 2015. Welcome :) Loved reading your books!